BlueBay Grand Esmeralda is an expansive all-inclusive resort situated in a lush tropical setting near Playa Del Carmen in the beautiful Riviera Maya. The beachfront resort features three swimming pools, children's clubs, great restaurants, a world-class spa and fitness center, luxuriously appointed rooms and suites, business meeting rooms and a premium location near Playa del Carmen. 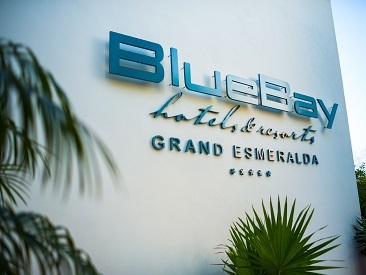 BlueBay Grand Esmeralda, a modern, all-inclusive hotel near Playa del Carmen, is situated in a natural spacious setting on the beautiful Riviera Maya. 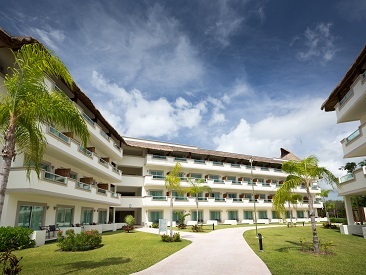 The BlueBay Grand Esmeralda, styled after an old world Mayan village, features casually contemporary guestrooms and suites spread out in eight 2 and 3 story buildings. This stunning property is located on a 1500 ft. stretch of sugar-white beach, just fifteen minutes from the trendy town of Playa del Carmen with its shops, boutiques, clubs and cafes. Special features include a spectacular meandering pool area, a spacious spa, special facilities for kids of all ages, concierge services in each guestroom building and a number of included water sports. 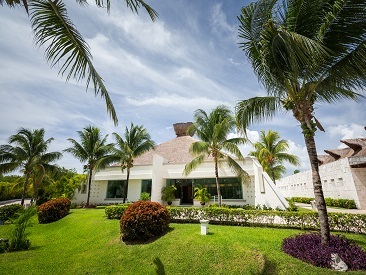 Ideally located near popular ecological parks and Mayan sites, couples and families with children will find this resort a perfect choice for an active, fun-filled vacation.